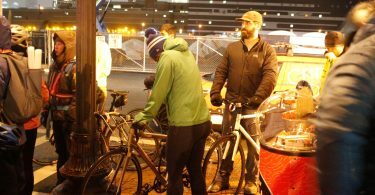 The Boston Midnight Marathon Bike Ride organizers and volunteers load bikes into the trucks that will meet the riders at Southborough Station, where the midnight bike ride starts. Boston, April 15, 2018. Photo by: Diego Marcano / BU News Service. 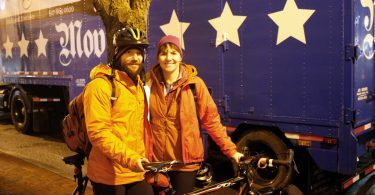 Brandon Brown and Jules Moran attend the Boston Midnight Marathon Bike Ride and load their bikes into the trucks that will meet them at Southborough Station, where the bike ride starts. Boston, April 15, 2018. Photo by: Diego Marcano / BU News Service. Jules Moran registers at the Boston Midnight Marathon Bike Ride. Boston, April 15, 2018. Photo by: Diego Marcano / BU News Service. 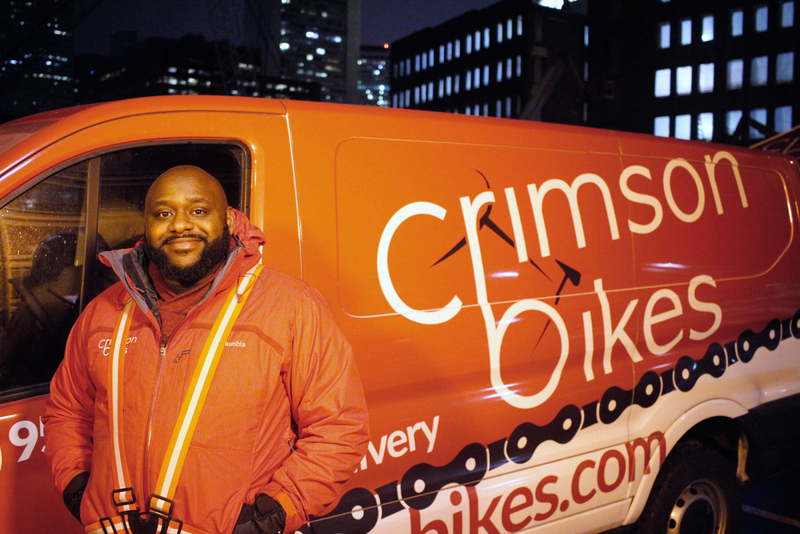 Charles James, owner of Crimson Bikes, stands by the van that will ride along the Boston Midnight Marathon Bike Ride to assist riders in case a bike breaks down. Boston, April 15, 2018. Photo by: Diego Marcano / BU News Service. 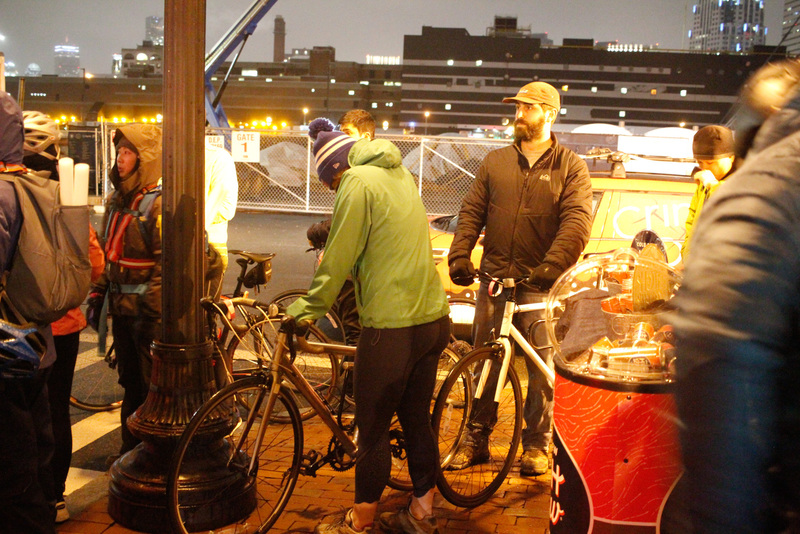 BOSTON — Steps away from the Fort Point Channel, between South Station and the Seaport Boulevard, cyclists entered a big parking lot on Necco Street. The gusty wind from the north pierced their reflective apparel. “Take off any panniers or mirrors. We got to fit them all,” said a tall, bearded man with beefy arms carrying bikes onto a truck. The cyclists chatted while they waited in line. 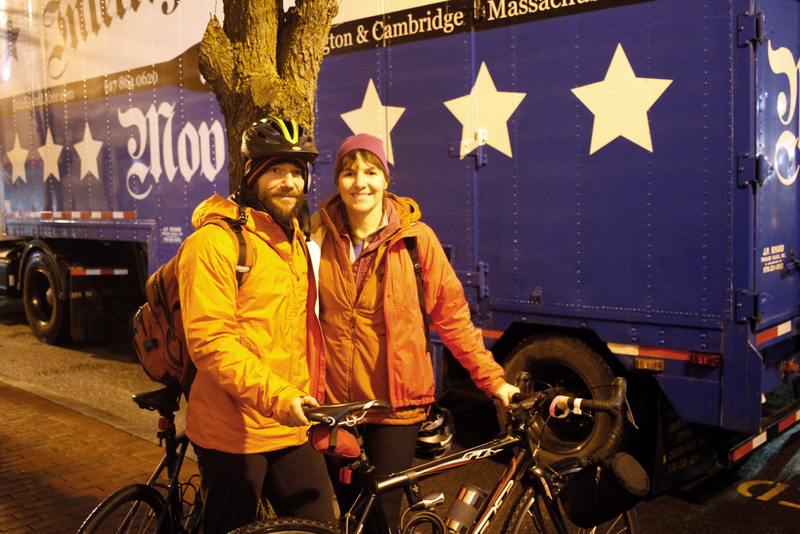 Boston Midnight Marathon Bike Ride has been gathering cyclists for 10 years. 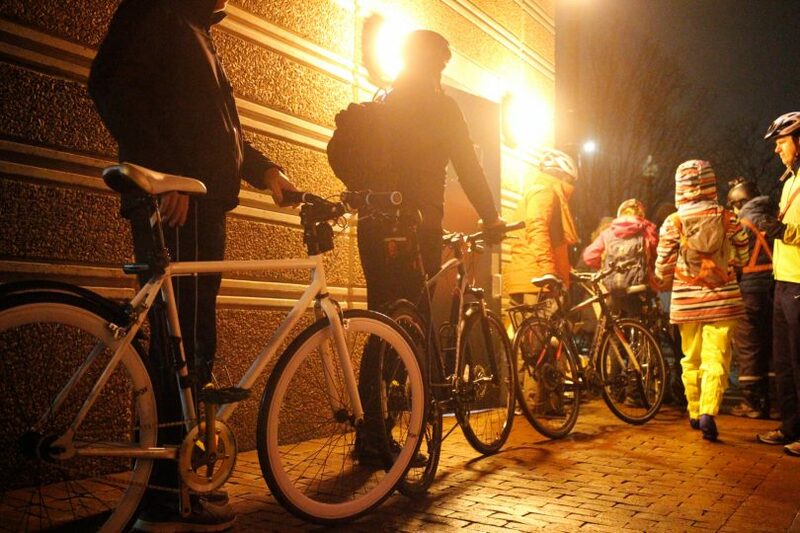 The night ride follows the same route Boston Marathon runners from all over the world follow a few hours later. The truck is a way the bike ride organizers make sure everyone finds a way around the MBTA restrictions of transporting bikes inside their trains. 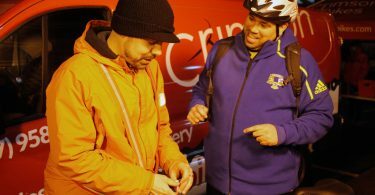 The truck meet the cyclists at Southborough Train Station to initiate the midnight ride. 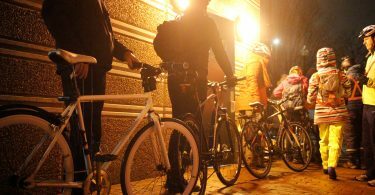 His friends took it seriously, and after they created a Facebook event, roughly 50 people rode the first midnight ride from Hopkinton to Boylston, finishing near the John Hancock Tower in Copley Square. After the first ride, the group decided to make it a tradition. The next year, about 70 people rode the Boston Marathon’s trail. 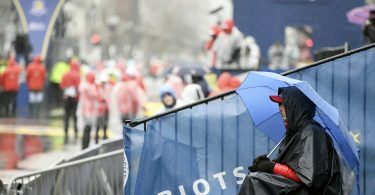 After 10 years, over 1,000 people get together at Boston’s South Station then ride a commuter train to Southborough station to pick up their bikes and ride the 30.6 mile traditional midnight marathon route, which includes a large, steep hill on Cedar St. and goes across the Boston Marathon start line. 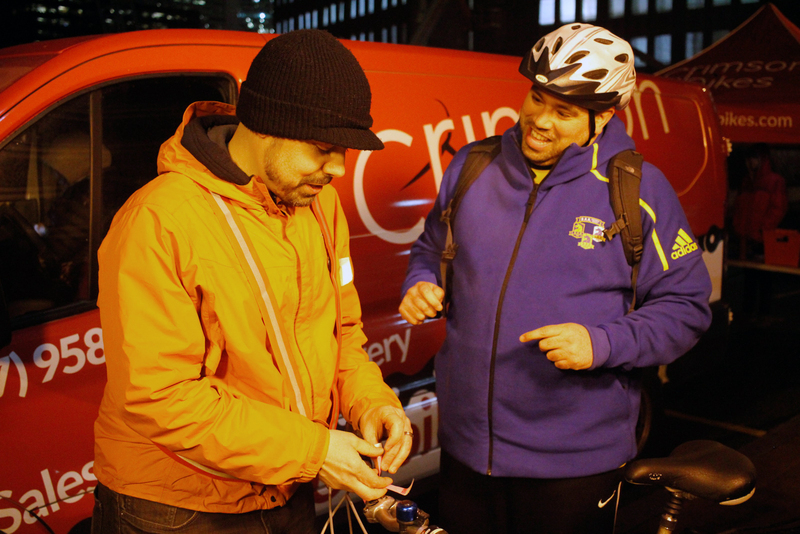 Charles James, owner of Crimson Bikes, has been involved in the Boston Marathon Midnight Bike Ride since 2013. He and his team adjust tire air, fix flat tires, break repairs and check riders’ shifts. 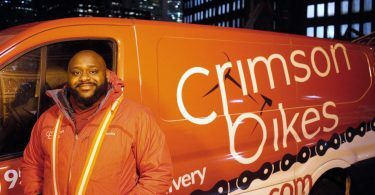 James and the Crimson Bikes crew put superhero music on their stereos and use a car and a van to follow the riders and assist them in case a bicycle breaks down. After leaving their bikes at the truck, the cyclists, dressed in light colors, streamed down Summer Street toward South Station. The car lights reflected on their fluorescent windproof and waterproof jackets. Some carried LED lights on top of their helmets, but don’t turn them on yet. There is regular vehicular traffic on the route and cyclists need to save their light batteries for the ride. 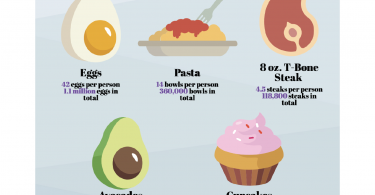 In 10 years, the Midnight Boston Marathon Bike Ride has not had any major incidents. Their organizers offer instructions to avoid accidents at a preparation meeting before the event. 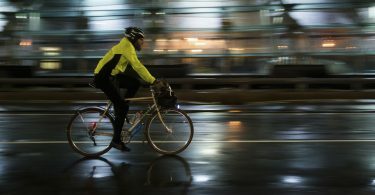 Under Massachusetts Law, cyclists are required to have lights on when riding at night. Specifically, a white light in the front and a red light (or reflector) in the rear. In 2013, the organizers asked a lawyer to write a blog post to convince people to use the right set of lights. The crowd of cyclists entered South Station. At the train’s platform one of the organizers shouted, “How many of you have done the marathon before?” Many raise their hands in response. “Welcome back, brave souls,” someone shouted from inside the crowd. The riders found their way inside the train. Rows of two on the right and three on the left fit the cyclists and some late commuters on the 10:40 p.m. train. Usually, Hum rides at the back of the group, making sure that everyone makes it safe back home. But this time, he said he was trying to go faster to build his body temperature and fight the cold. “Some finish the trek in 90 minutes but most people take from two to four hours to get to the finish line,” Hum said. 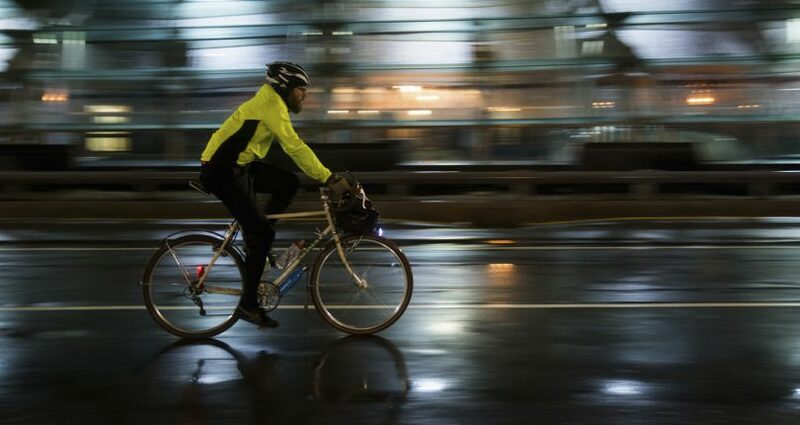 At about 2:30 a.m., two and a half hours after the start of the ride a trail of LED lights rushed through Beacon Street in the west end of Boston. The rain fell lightly. Cyclists passed swiftly and others fell behind, strolling at a slower pace. This year, the victorious midnight ride cyclists celebrated at the Boston Common Coffee Co. There is no trophy, medal or podium waiting for them, but for a $15 ticket, they have breakfast together: three pancakes with three strips of bacon and coffee or water.